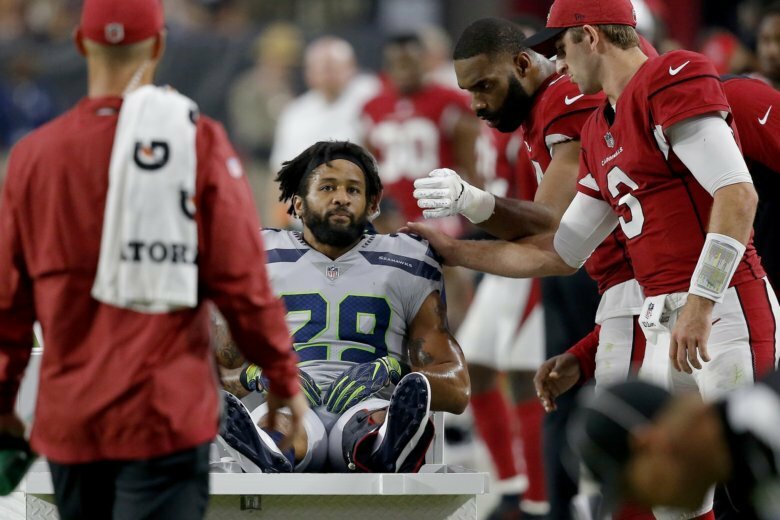 Any hope of recalcitrant running back Le’Veon Bell returning to the football field in the black and gold — or any other team’s colors — any time soon took a major hit when Seattle star safety Earl Thomas broke his lower left leg, illustrating the dangers of playing without the security of a long-term deal. ESPN posted the quote and a photo of Thomas’ obscene gesture, and that’s when Bell chimed in , suggesting he wouldn’t be back on the field anytime soon. NFL Network reported earlier Sunday that the Steelers were shopping Bell. Other takeaways from Week 4 include a fourth-down gamble that backfired on Colts coach Frank Reich, the “Big Four” rookie QBs going 0-4 Sunday after the hype meter cranked up to high last week and the Ravens tricking the Steelers and the officials on a trick play in their 26-14 win over Pittsburgh. Reich earned kudos from both his players and the Texans for his decision to go for it on fourth-and-4 from his 43 with 27 seconds left in overtime rather than punt, bury Houston deep and settle for the NFL’s third tie game. With his favorite target, T.Y. Hilton, on the sideline with a hamstring injury and a short week ahead with the New England Patriots on tap Thursday night, Andrew Luck bounced his pass to Chester Rogers. The Texans took over and Ka’imi Fairbairn missed a 37-yard field goal as overtime expired. But wait! In yet another call that backfired, Reich had called timeout. Fairbairn nailed the do-over to end the league’s longest losing streak at nine. Reich’s only regret was calling timeout before the fourth-and-4 play after the Texans didn’t jump offside, he said. Luck’s only lament was misfiring the pass, but he loved the bold call. After a dominant debut against Detroit in the Jets’ opener, Sam Darnold has cooled off in three straight defeats, including a listless loss at Jacksonville on Sunday. A week after being hailed as a hero for leading Cleveland to its first win since 2016 by rallying the Browns over the Jets in relief of an injured Tyrod Taylor, Baker Mayfield had four turnovers in his first NFL start, a 45-42 overtime loss to the Raiders. Mayfield threw for 295 yards and two touchdowns but suffered a pick-6, got strip sacked, fumbled a snap and threw an interception in the final seconds of regulation. Josh Rosen had a strong debut in his first start for Arizona but it wasn’t enough to keep the Cardinals from falling to 0-4 for the first time since 1986. Josh Allen accounted for three turnovers in the Bills’ 22-0 loss at Green Bay a week after a stunning win at heavily favored Minnesota in his starting debut. Baltimore coach John Harbaugh was furious when the Patriots fooled the Ravens in the playoffs a few years ago with a trick play to an eligible receiver who looked like he was lined up as an offensive lineman. The Ravens stole that idea from New England eight months later and unwrapped it again Sunday to fool the Steelers. Tight end Maxx Williams lined up next to the center as the left guard but just far enough off the line of scrimmage to make himself an eligible receiver. He was wide open for a 22-yard gain that set up a field goal for a 23-14 lead. Retired referee Terry McAulay, now an NBC Sports rules analyst, said Williams probably shouldn’t have been an eligible receiver on the play, but no flag was thrown. With contributions from AP Pro Football Writer Dennis Waszak Jr. and AP Sports Writer Michael Marot.